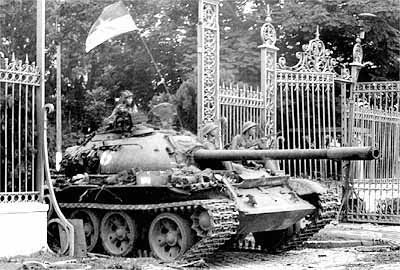 That's the actual tank or rather one of the 2 tanks that broke through the gates of the seat of power in South Vietnam effectively ending the Vietnam War. This is an exercise in comparing the past with the present. Why is the past so important? Orwell stated that "He who controls the past controls the future." What future can we perceive in a simple visit to a tourist trap. One of the most historical sites in Saigon, which is now called the Reunification Palace, is a tourist attraction. It was the seat of government for South Vietnam, and when it fell to theNorth Vietnamese, it basically spelled the end of division of the country. For many Americans, it also is a symbol of our failure to win a war despite all the military advantages of being a superpower. This is how it stands as of 2010. It is a tourist attraction, complete with tours and other such typical tourist things. Remember, this is sort of like the White House for the South Vietnamese government. It sort of looks well . . . not that impressive or very stately. As a bunch of professors walk into the palace, a few military personnel walk the other way. Although there were some nice rooms, the impression was that this government was not interested in a whole lot of pomp and circumstance. Even official rooms were not very extravagant. Well, what we really got out of it was a picture of Brian in front of a circular rug. This is where the flag of South Vietnam was taken down, and the North Vietnamese flag was raised, and still is raised today. Now a tourist spot, it is supposed to be a symbol of a beginning--the new Vietnam. More interestingly, many of the tourists are actually Vietnamese. What are the causes of war. What are the effects of a war. In America, there is this strange obsession with this war in our popular culture. In Vietnam, there is also a strange obsession with this war in various official sites of interest like the Reunification Palace. Why did this all happen?